Congratulations, Karen Ang! She is the winner of the TKEES promo. There were 539 entries (more if I counted the doubles, spammers and unidentifiables) and more now because people are still joining (folks, contest is over). 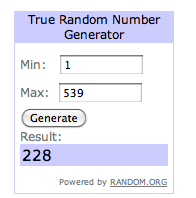 I used Random.org to generate a random number, and it chose 228. Congrats, Karen! I'm sending you the GC this weekend.